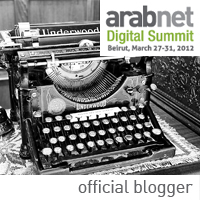 ArabNet Digital Summit 2012, the biggest event for web and mobile in the region, is less than 2 months away. Last year’s summit brought over 1000 attendees, 100 speakers, featured 18 panels and 17 talks, in addition to 20 entrepreneurs pitching their ideas and startups. I will be an official blogger for the summit and you will be reading more about the event on Mind Soup!